In their last post, Craig Morris and Arne Jungjohann show the impressive overlapping between French and German energy goals. Today, they investigate historic targets for nuclear and renewables in the two countries. One key finding is that French nuclear history is not properly understood. As we explained in our last article, the Germans and the French have astonishingly similar goals for nuclear power. Germany aims to reduce the share of nuclear power from a peak of around 28 percent to zero percent by 2022, with 17 nuclear plants closed in the process. France aims to reduce the share of nuclear by 25 percent (from 75 to 50 percent) by 2025, with an estimated 22 nuclear plants needing to be closed. A number of these nuclear plants were built at the beginning of the 1980s or earlier, making them around 40 years old – ready to be shut down anyway if their commissions are not going to be extended further. You then either fill the gap with new nuclear plants or something else, such as renewables. To reduce its reliance on nuclear, the French will have to start by shutting down at least one nuclear plant, and that is proving to be difficult politically. A few weeks ago, the French Senate voted to repeal the government’s current policy (report in French). My French colleagues tell me that the vote is not binding, but merely an expression of rejection from the political opposition. Still, France’s nuclear reduction is anything but a done deal. One reason is economic dependence. France put so many of its eggs in the nuclear basket, and now there are the first reports that engineering firm Areva might be bankrupt because sales of new nuclear plants worldwide are so sluggish. The government, which owns five sixths of Areva, is thinking about merging the company with the utility EDF, which it also owns most of. Unlike Germany, France lacks a specific roadmap; there is no proposal for what plant would go down when. We might expect France to start with the oldest nuclear plant, but Environmental Minister Ségolène Royal stated last fall that Fessenheim might not be the first to go. In mid-January, she announced that France might need to build “a new generation of reactors.” Here, we have a stark difference between Germany and France – new nuclear plants have been off the table in Germany for decades. But note how Royal worded the government’s position: she defended (article in French) the policy of “getting out of all-nuclear” (sortir du tout nucléaire). Here, something easily gets lost in translation: all-nuclear (tout nucléaire). The objective was to replace oil, coal, and gas in all sectors with 100 percent nuclear power. But France never got more than around 40 percent of its energy for electricity, heat, and transport from nuclear. As impressive as the growth of nuclear power in France was during the 1980s and 90s, the outcome fell far short of the original goals. In 1974, French Prime Minister Pierre Messmer announced a plan that would come to be named after him. In English, Wikipedia explains that the goal was to cover all electricity demand with nuclear power, but that is incorrect. The French Wikipedia entry is no better; it does not even mention the failed “tout-nucléaire” policy, nor is the Messmer Plan a term used in the article. In reality, the full slogan was “all-electric, all-nuclear” (tout-éléctrique, tout-nucléaire). The fact that it has disappeared from public awareness speaks volumes about how poorly we understand the actual historical developments. Although the idea had been on the drawing board for years, it wasn’t until the oil crisis of 1973 that French experts presented the plan. The public was not asked what it thought. Both Pierre Messmer’s French and English Wikipedia entries says the Messmer Plan originally envisioned “13 nuclear plants.” In fact, the plan adopted on 5 March 1974 sought to have 44 nuclear plants with a total capacity of 50,000 megawatts under construction by 1980 (PDF in French). In the wake of the oil crisis, the focus was on energy independence, but 40 of those 44 plants were to be built with Westinghouse licenses, with only four being “French design.” France has never produced significant amounts of uranium either; indeed, it has imported 100 percent since around 2000. Nonetheless, French power provider EDF says even today (website in French) that the goal was “greater energy independence for France” (“Ce programme de grande envergure participe à l’indépendance énergétique de la France.”) Embarrassingly, the website also speaks of “13 nuclear plants” as the goal and lists Fessenheim as though it were an example of the 1974 Messmer Plan. In reality, Fessenheim had a building permit in 1967, and the project began in 1970. It is only from French critics of nuclear, such as Monique Sené and Sezin Topçu, that we hear the whole story. By 2000, 170 nuclear plants were to be online in France. The country now has 59 in operation, just over a third of the target. This shortfall is not only dramatic, but also typical of the nuclear sector. While its proponents continue to argue that fear-mongering Greens hamper the progress of nuclear, the real problem is that the nuclear sector has reliably failed to reach its own targets (including completing EPR power plants on time and within budget). The German government also originally planned to have 45 nuclear plants built, but it never had more than 19 online at the same time. In 1973, US President Nixon called for 1,000 nuclear plants in the US by 2000, but the US never had many more than 100. These unrealistic targets had a tradition by that time; in 1957, the Three Wise Men of Euratom had called for 15,000 megawatts to be installed within 10 years in the six member states in Europe. At the end of 1973, these six countries still only had less than 6,400 megawatts installed. Compare that underperformance to the projections for renewables. In 1997, the German Environmental Ministry assured the public (website in German) that the amount of wind power could be increased to “nearly 20 TWh” annually by 2010. But in 2004, the country had already generated 25.5 TWh of wind power. The level increased to 37.8 TWh in 2010, roughly twice the level the government promised was “realistic” 13 years earlier. For photovoltaics, projections were even more off. 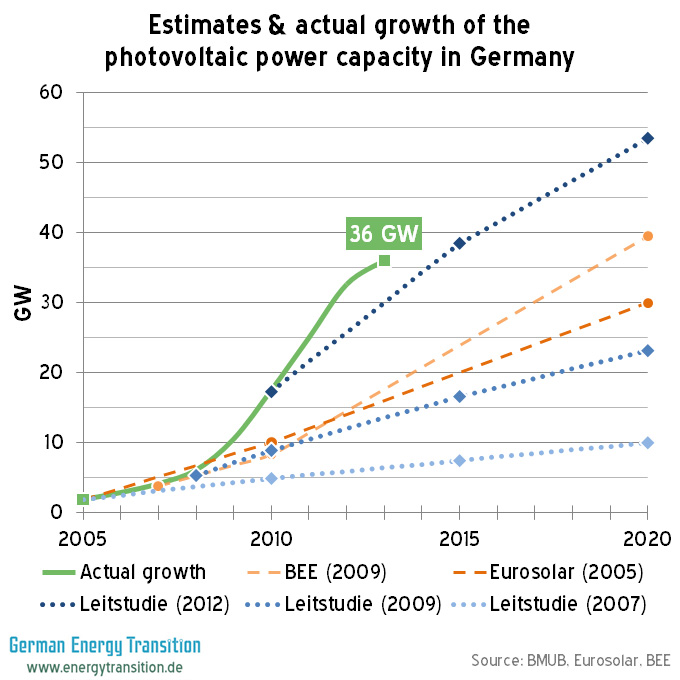 In 2008, German experts believed 29.0 GW of PV would be installed by 2050. That target was reached in 2012. A few lessons are easy to draw from this comparison. First, if you want to get a lot of your energy from nuclear power, you have to set goals several times higher than your actual target. Second, as the French example shows, after a few decades, this commitment to nuclear apparently leads you back out of such a heavy reliance on the technology. One reason may be public opinion. The French remain basically split over nuclear, with roughly half supporting it and half opposing it; a recent poll published by Le Parisien found that 53 percent of the public support the government’s plan to reduce the share of nuclear in power supply by 25 percentage points by 2025. Polls taken in Germany generally show much greater public support for the Energiewende. Which brings us to our final conclusion: it’s a good idea to have democratic legitimacy for energy policy. A lot of that renewable capacity was built by normal German citizens. People can build renewables even faster than the government expects. The above mentioned “around 40 percent of its energy” refers to the primary energy supply, while saying energy for electricity, heat and transports indicates final energy consumption (those are end use sectors, they consume final energy). This is problematic because mixing primary energy and final energy is distorting the facts, simply because primary energy data (physical energy content) for nuclear includes about 66% statistical hot air. Nuclear energy penetration in France is far less impressive when looking at final energy consumption. In 2012 nuclear energy had a share of about 17% of the net-final energy consumption. (That’s actuall consumption of energy(electricity/fuels, heat, etc.) by all sectors w/o conversion & transmission losses). In Germany the final energy consumption share of renewables was about 12.4% in 2012. This distinction is obviously a bit much to make in a post on a different topic, but I would suggest that whenever primary energy supply (or consumption) is referred, it should be clearly stated to avoid confusion. 1) The research into historical goals is interesting, but people can imagine wild scenarios on both sides. You did not discuss the inconvenient stories – How many proponents imagined a world with renewables and soft energy back in 1970’s? How bad were their projections? 2) Comparing %’s is highly misleading. Missing the high nuclear targets is very different from overachieving the renewables target. How about comparing the total actual magnitude of energy contribution? Another example: do you really believe France 75%->50% nuclear and Germany 25%->0% nuclear is “the same path” ??? One country’s politicians proposes to cut 1/3 (33%) of its nuclear and another is working on its plan to cut all (100%) of its nuclear. You are really twisting the numbers when you try to say they are “the same”. 3) Even though 100% of uranium is imported, nuclear power contributes significantly to energy independent, because only 10-20% of the levelized cost is for fuel and waste. Uranium can also be stockpiled and sourced from many more countries than fossil fuels. As for construction, a license does not make a country “dependent.” Also there is a parallel with where renewable power technology comes from… This means nuclear contributes significantly to energy security. 4) Regarding “final energy” vs “primary energy equivalent”, the results for BOTH renewables and nuclear are adjusted upwards by approximately 3, to account for the approximate amount of coal equivalent to generate the same amount of final energy. This is especially relevant to Germany, because it gets so much energy from coal. In fact, by only looking at final energy, you are “mixing up” a kWh from coal with a kWh from solar or nuclear. What inconvenient stories from the 1970s are you talking about? Please provide links. Otherwise, we do list forecasts for renewables, all of which fell short of reality. Your #2 and #3 are as good a defense as can be made – congratulations! #4 is completely wrong. Differences are reported between primary and final energy for coal and nuclear, not for wind and solar. So did the original plan call for 44 or 170 units? It delivered more than one, less than the other.. Given as is now, French nuclear delivers all of French baseload and more, and they generate about as much electricity as Germany, exporting a lot of excess,I can’t see any sensible plan calling for three times the amount they have now. The only way that I could see three times the amount of units making sense is if the units were approximately three times smaller. Which given how much larger the more recent units are, is plausible. Either way, you should just compare on a MW installed rather than number of units to say anything about over or under delivery. less than half of french support nuclear because they think nuclear is like coal , most of the french average Joe is clueless about how nuclear works and think that nuclear emits co2 just like coal, THAT is the reason so many of them are against nuclear, but you fail to explain that in this wanabbe impartial article, and that my dear author, is manipulation. Next PostThe French energy transition: hope for the best, prepare for the worst?